AFC Oakley M&DH came from 3-0 down to beat Sharnbrook 5-4 at the death to earn their place in the Britannia Cup final. They will now face either Cranfield United or Ampthill Town Reserves in this season’s final at Hillgrounds on May Bank Holiday Monday after coming from 3-0 down inside the first 20 minutes and then 4-2 down early in the second half to net three goals in the last 15 minutes. Shaun Barnett with a hat-trick plus strikes from Elijah Hukin and Robbie Alder brought up the nap hand against home replies via Jordan Baxter twice plus Richard Ball and Michael Pickard from the penalty spot. Renhold United, in taking their winning ways up to eight games with a 3-0 victory at Ampthill Town Reserves, now find themselves six points clear at the head of the Premier Division supported by Sportsform league table. Wesley Lewis netting twice and Ashley Dummond once to do the damage. Down at the other end of the league bottom of the table Elstow Abbey were denied their first away point of the season when losing 3-2 at Sandy after they had taken a 2-1 lead with just five minutes left to play before goals from Matt Johnson and Nathan Morris won all three points for the hosts. Earlier in the game Antony Sammut had shot the Abbey in front 25 minutes in before Jack Webb levelled matters for the hosts a minute into the second half. Whilst second from bottom of the table Eastcotts AFC have now lost their last eight league outings after being beaten 2-0 at Ickwell & Old Warden for whom Lee Threadgold and Ryan Grant netted the goals to do the damage. Elsewhere Shefford Town & Campton took their unbeaten away ways up to five games by sharing the spoils in a 1-1 draw at Pavenham. James Owen netting for the hosts and Jerome Mullings for the Town. The Marston Shelton Rovers v Flitwick Town game was postponed. Before an Allen Park crowd of 100 plus hosts Queens Park Crescents made their way into this season’s final with a 2-0 win over Shefford Town & Campton Reserves thanks to goals from Fabio Sattar and Shazed Sattar. They will now meet the winners of the yet to be played semi-final tie between Henlow and Ickleford in this seasons final. Ickleford will now travel to Henlow for a last four tie after beating Westoning 3-1 in a game that was switched to their own Stotfold Recreation Ground pitch after Greenfield Road was again unplayable. Tony Miceli fired them ahead in the 21st minute then netted again 13 minutes later when after seeing his penalty beat out by Westoning goalkeeper Alex Benet he was first to react to send the rebound past the luckless Benet to make it 2-0. Bryn Reynolds was to reduce the arrears to 2-1 just 16 minutes from time to set up a grandstand finish which saw Miceli complete his hat-trick some four minutes into time added on. 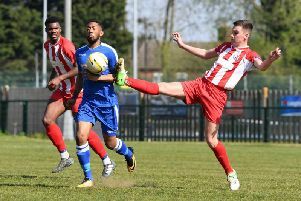 Stevington in maintaining their unbeaten home ways with a 4-1 victory over Henlow are now just six points behind league leaders Sundon Park Rangers having also played two games less. Kieran Souter with a brace joined on the scoresheet by Reece Williams and Daniel Bentley against one in reply from Luke Purchase. The biggest winners of the day being AFC Kempston Town & Bedford College who returned to winning ways for the first time in eight outings with a 7-2 home victory over second from bottom of the table Houghton Athletic, Joe Price leading the way with four goals and joined on the scoresheet by Matt Cheveralls, Mark Allen and Giovanni Moscartolo against Athletic replies via Mark Doran and Ali Mohiyaideen. The AFC Oakley M&DH Reserves v Sundon Park Rangers game was waterlogged off. This season’s final tie will be a Cranfield United Reserves v Flitwick Town Reserves affair after both emerged home Semi-final winners. United thanks to a brace of goals from Adam Kerr and a strike from Jordan Conway seeing off Clapham Sports 3-1 for whom Ishmael George replied. Whilst the Town beat Cople & Bedford SA 4-2. David Keefe netting three times and Mark Funnell once against SA replies via Ollie Hughes and Daniel Collins. The lone game of the day saw Kempston Hammers Sports run out 4-0 winners at second from bottom of the table Kempston Athletic. Dan Havil with a brace joined on the scoresheet by an own goal plus a strike from Shaun Winkonek. Third place Caldecote Reserves are now unbeaten in their last 10 league outings after winning 3-1 at second from bottom of the table Meltis Albion Reserves. Carl Heath, Chris Gregory and Joe Baker on their scoresheet against a lone home reply from Jake Taylor. Whilst fourth place Wilstead Reserves were 5-0 home winners over Dinamo Flitwick to record their seventh league win on the bounce. Luke Pursey leading the way with a hat-trick and joined on the scoresheet by Ryan Davenport and Liam Fenton to bring up the nap hand. Elsewhere for bottom of the table Clifton following 10 straight league defeats it was a return to winning ways with a 5-0 home victory over Shefford Town & Campton A. Charlie Watson netting four times and Josh Angell once. In the day’s lone game Mid Beds Tigers took another step towards the division four league title by winning 3-0 at second from bottom of the table Henlow Reserves thanks to two goals from Harry Ball and a single strike from Liam Brophy. Bedfordshire Saturday Youth side Ampthill Town will now face a home quarter-final tie against either Lidlington United Sports or Sandy Reserves who had their second round tie at Hurst Grove waterlogged off after they emerged home 3-1 penalty shoot-out winners over Bedford Albion. Simao Faia for the Town and Dan Jeffries for the Albion netting in the opening 90 minutes to make it 1-1 before successful spot kicks from Josh Hodgeman, Elliot Smith and James Tiller won the day for the Town. Current division three league leaders Wixams saw their hopes of a league and shield double evaporate when beaten 3-1 at Renhold United Reserves. Michael France, Nathan France and Sunny Chana netting the United goals against one in reply via Iain Hall. Joining them in the last four will be AFC Dunton and Caldecote A after they both won on home soil. Dunton with braces from Jimmy Fuller and Tony Norman plus a strike from Kier Banghard the 5-4 winners over Bedfordshire Saturday Youth side Sacred Heart Offley for whom Stephen Shallow replied twice alongside Aedan Edwards and Nanthan Bangs. Whilst division four Caldecote A produced another giant killing act to net an 8-7 penalty shoot-out win over division three Sundon Park Rovers after 90 and 120 minutes play had seen the sides deadlocked at 3-3. Kieran Patterson, Paul Rannow and Chris Lamb the home marksmen against Rovers replies via Jordan Holmes twice plus Nick Buttigeig once.